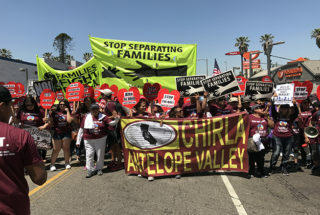 CHIRLA members marching on May Day in Los Angeles in support of immigrant rights. Although the Trump administration announcement that protections for young “DREAMers” under the Deferred Action for Childhood Arrivals program will continue for now, Los Angeles immigrants and their advocates believe the risk of being deported is even greater. The DACA news came in an announcement late Thursday by National Security Secretary John Kelly as he declared an immediate end to a 2014 order known as DAPA, which was meant to protect undocumented parents but was challenged by 26 states and never implemented. “The Trump Administration callously chose to deal the final death blow to DAPA and DACA precisely on the day we celebrated the fifth anniversary of DACA. This decision adds insult to injury as the Trump Administration’s main focus has been to criminalize, malign, and deport immigrant families since coming to office,” said Angelica Salas, executive director of the Coalition for Human Rights of Immigrants (CHIRLA). Although some saw the news as a relief for the “DREAMers,” the 800,000 who were brought to the U.S. at an early age and are protected by DACA, others were adamant that it was not good news and only heightened fears. “I feel the same as I did before, very worried. Nothing has changed,” said Kathia García, who is covered under DACA and lives in LA. “Yes, somehow I’m safe with DACA, but what about my siblings, my parents, are they going to deport them now? I think we are paying a very high price for being protected and at the same time afraid of being separated from our families,” said García, who recently graduated from Cal State Los Angeles. Eileen Truax, an LA-based freelance journalist covering immigration and author of a book on DREAMers, said the announcement changes nothing for immigrants. “It is nothing more than a reaffirmation of DACA. It is still not a path to legalization,” she said. Parents are now even more likely to leave and take their children back to their country of origin because with DAPA “there was hope and now it is lost,” said Susana Zamorano, parent organizer of CARECEN LA, the largest organization for Central American immigrants’ rights in the country. “Children will lose their educational future and the opportunity to be raised in this country,” she said. “If parents are at risk, children are at risk,” Zamorano said. “How can children be at peace knowing that at any moment their parents can be deported? That announcement is an attack on the emotional, academic, and psychological stability of children,” she added. Educators for Excellence (E4E), a teacher-led organization, praised the preservation of DACA as an important step toward safeguarding key rights for undocumented students but expressed disappointment regarding the end of DAPA. Despite the death of DAPA, some believe that the federal statement allowing DACA to continue for now can be seen as a victory. Sandy Mendoza, advocacy director for Families in Schools, an organization that supports parents in LA Unified, believes DACA beneficiaries remain in limbo but at least they can feel some relief. “They still do not know if they can stay permanently in this country or not,” she said. “They remain without stability, but for now they can rest easy,” she said. But she stressed that the DACA beneficiaries will continue with the uncertainty about how long they will be protected.